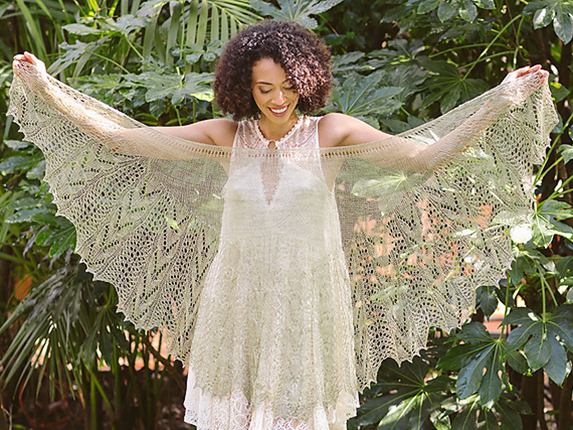 Titania’s Shawl begins with unexpected construction highlighting the eye-catching panels of alternating lace that shimmer in the celestial-like silk of Hand Maiden Fine Yarn’s Lace Silk. The beads are attached using a bead crochet hook. Finished Size 28” tall at center and 56” wide. Yarn Hand Maiden Fine Yarn Lace Silk (100% silk): artichoke, 1 skein. Needles Sizes 6 (4 mm), 7 (4.5 mm), and 9 (5.5 mm): 32” circular. Adjust needle size if necessary to obtain the correct gauge. Notions Markers; cable needle; size 10 (0.75 mm) steel crochet hook; 375 size 6⁄0 (4 mm) seed beads; tapestry needle. Gauge 18 sts and 23 rows = 4” in St st on medium-sized needles.